Creamy pasta, come to me! 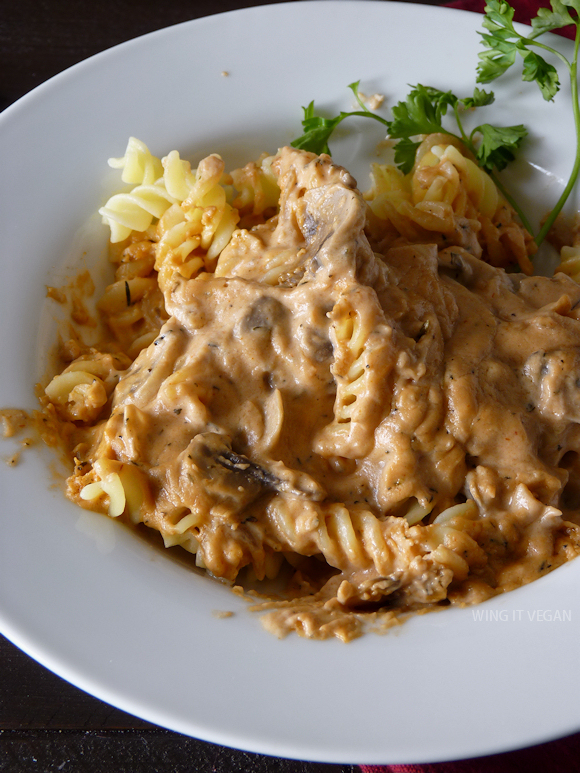 This is the Tofu-Mushroom Stroganoff from Isa Does It, minus the tofu. 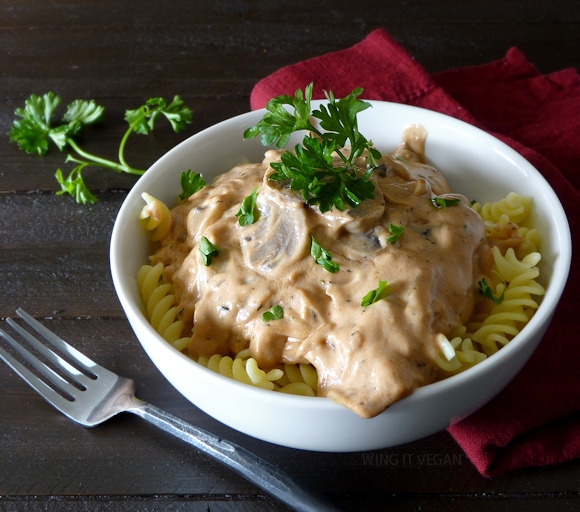 I like tomato-based pasta sauces, but my heart entirely belongs to creamy, smooth, cashew-based* sauces. This dish was as excellent as I expected it to be, even without my precious tofu that I miss so much. It's velvety and mild, but definitely not lacking in flavor thanks to the yummy sautéed onion and garlic. The mushrooms are there, even if you can barely see them in my pictures. The recipe says to garnish this dish with flat leaf parsley, but I used curly parsley because I do what I want! Also, it was the only type of parsley that I had. When I was eating it I realized that this dish looks more irresistible when it's all messy and all the noodles are coated with the saucy goodness, so here's a quick shot of that. 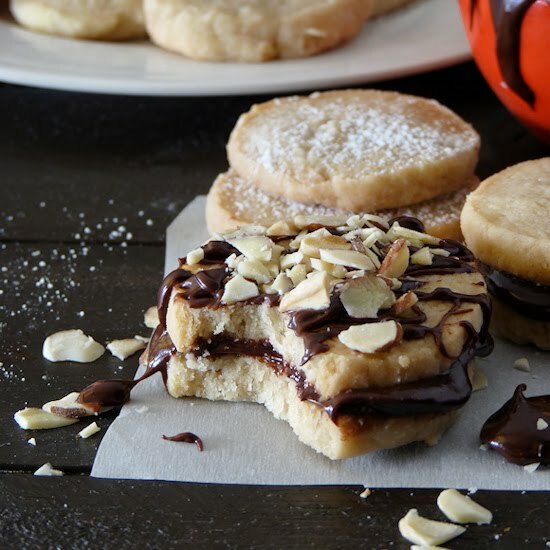 * If you have a nut allergy, I don't see why you wouldn't be able to make this with sunflower seeds instead of cashews. I have made this Sunflower Mac before, also one of Isa's recipes, and I can tell you that it was delicious and super creamy. So go forth and nomnomnom! Do you have a copy of Isa Does It? - No? Don't worry, you can find the recipe here. Yeah! Awkward high-five for you too! You know who's not getting a high five? This pesky duck that landed on one of our bird feeders and ate all the food, that's who. Mmm it looks good! I'll have to buy that cookbook because I've heard so many good things =) I agree, food does look extra delicious messy! I haven't tried that one yet, it looks delicious! 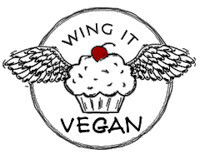 Oh you must try it soon! It's delicious indeedy! LOL! Maybe you're offering yummier food than I am. 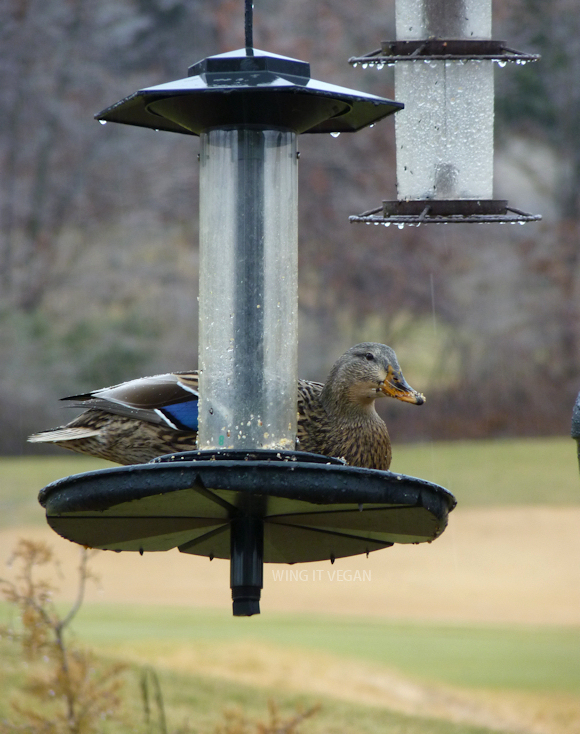 What are you putting in the feeder? Oh, man! 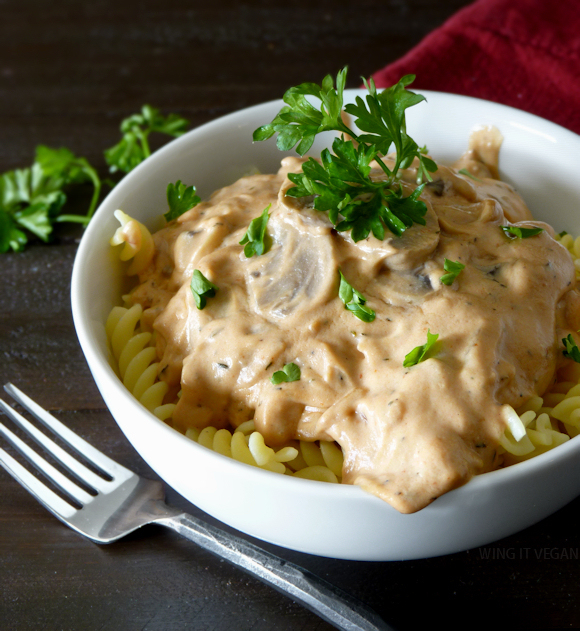 That mushroom stroganoff looks so good! I've got to try that one. The picture of the duck on the bird feeder is hilarious. He seems to be saying, "What? I'm a bird! It's valid." Yes, you have to try it, Cadry! You'll love it! Awkward high five right back at you! I do have the book, but I haven't made this recipe yet. The duck looks pretty chuffed with himself. I have a review of Isa's book going up tomorrow, so YES I have a copy. Isn't it the most beautiful book? Tonight I made Wild Rice Soup and it was great. Changed the ingredients a little, though, but that's what we do, isn't it? Awkward high five! The photography is stunning! I love cookbooks that have lots of pictures and this one doesn't disappoint.